Committee Chairman Rex Duncan, R-Sand Springs, took another legislator's bill (that was designed to deal with a completely different issue) and persuaded the committee to put in his ban on eyeglasses, scarves or other head wear in driver's license pictures — with no exception for things worn for religious reasons. Duncan said the proposal started with a recent Norman incident in which a Muslim woman got into a dispute with the tag agent over a driver's license picture involving her hijab — a traditional head scarf worn by Muslim women. The tag agency wanted her to push the scarf past her hairline, which she felt violated her religious practices. The situation didn't need legislation, but Duncan acted anyway. How's this for an unintended consequence: We're sorry, Sister Mary, but if you want a driver's license, you'll have to take off your habit. The Hijablog is leading the movement. Based in Norway, the woman behind the blog writes about everything from political issues (such as the recent debate surrounding hijab-clad women joining the Norwegian police force) to Islamic wedding fashion in Malaysia. Another one is 'Is there food on my Niqab'. 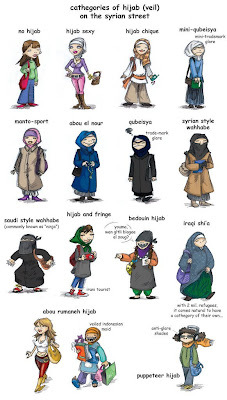 HijabiStyle is a blog which captures the myriad styles of hijab, as well as a variety of different women's perspectives on wearing it.